The Boise Bench has a long history as the first real residential suburb to Boise’s Downtown. Originally arid desert land like the ground south of Interstate 84, the arrival of the New York Canal in the late 1800s changed that and brought a largely agricultural flavor to the land. Crews finished the iconic Boise Depot in 1925 which brought people and development to the area. Boise’s population grew by leaps and bounds in the 1930s and 1940s and new housing tracts came along with it. Idaho’s First Shopping Center – Vista Village – was completed in 1949 – along with one of the first Albertsons stores (now a Rite Aid). As homes and neighborhoods aged, the Bench became dominated by long car-centric thoroughfares which surrounded mature neighborhoods. Now City of Boise leaders and the Capital City Development Corporation are looking at how urban renewal could boost development along those major streets. 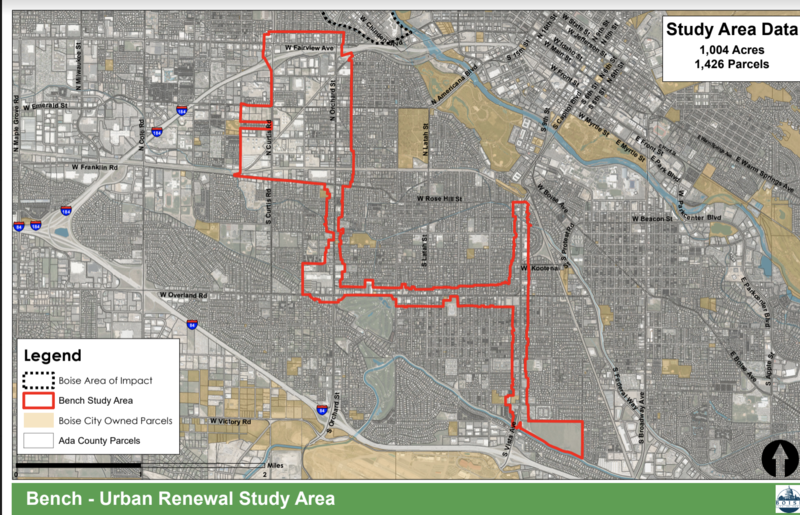 BoiseDev first reported on the plans for an urban renewal district on the Boise Bench two years ago. Since that initial reporting, the plans have morphed – but the district is still a ways from creation. The area now being studied includes most of the area along Vista Ave., as well as Overland Rd. from Vista to Orchard St, Orchard from Overland down to Fairview Ave – and a large area from Orchard to Curtis Rd. that includes the current Boise tank farm site. The Hillcrest Shopping Center site at Overland and Orchard. It has suffered withvacancy. It is currently listed for sale for $16.9 million. Several plans for redevelopment on the parking-dominated site have not come to fruition. The Simunch farm on Victory Rd., just below Sunrise Rim and the New York Canal. The 62-acre farm site is surrounded by residential development. It was owned by Marko Simunch who died in 2016 and worked to farm the land until 2015. 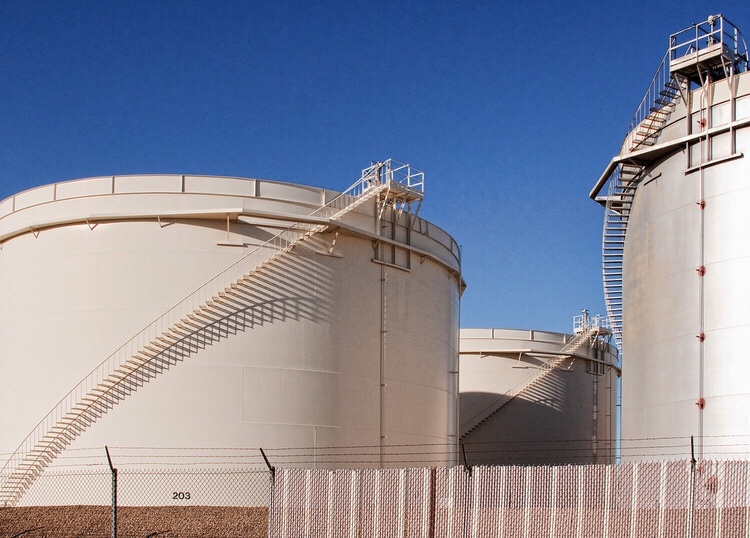 The Tesoro/Chevron Tank Farm in the Curtis Rd. area. We reported the tank farm could move to a site near the Boise Airport if city officials can forge a workable plan. A largely industrial area between Orchard and Curtis. CCDC and the City of Boise have fast-tracked plans to build industrial infrastructure in a new area south of Interstate 84 in the east part of Boise. New capacity in that area could allow for redevelopment of warehouse properties closer to the city core. The study area stretches all the way to Fairview Ave. and includes the site of the Idaho Statesman and KTVB-TV. The Vista Avenue corridor. The Urban Land Institute worked with city officials as part of a grant project in 2015 to study the area along a 1.7 mile segment from the Boise Airport to Rose Hill St.
CCDC’s project manager for this potential area is Doug Wodruff. He said transportation is one of the big drivers for improvement in the area. In Idaho, urban renewal districts use public funds to reshape areas with items like transportation, infrastructure, parking and streetscapes. The districts are funded with tax increment financing – expected gains in tax revenue through increased property values. Disclosure: The author’s family owns the Vista Village Shopping Center which is in the study area, as well as several parcels just outside the proposed boundaries. He does not have a direct interest in the business.